Mileage Search: --Select miles-- 10 mi. 25 mi. 50 mi. 100 mi. 150 mi. 200 mi. 250 mi. 300 mi. 350 mi. 400 mi. 450 mi. 500 mi. Help update BAEN's Directory and earn FREE Photo Ads. If you find a listing that needs flagging, let us know. Examples: wrong category, broken web links, duplicate, business no longer exists, etc.. Email bayequest@gmail.com and include the ID number of the listing along with your comments. We'll say thanks for your help with a FREE photo ad (maximum value $22). Independent Saddle Fitting Consultations for English & Western riders. English saddle flocking. Western saddle/ pad assessments. Equine massage. Saddle consignment. Serving the Bay Area, the Central Valley from Redding to Fresno, and the foothills beyond. Please email for quickest response. We make beautiful horsehair necklaces, bracelets and earrings! We can custom make one for you out of your own horse's tail or from our stock of horsehair. We are extremely reasonable in price ranging from $10-$75. Check us out on Facebook by searching Equine Tails Western Design! New and consignment saddles, tack and apparel for the horse and rider. Be sure to follow us on Facebook as we post new merchandise on a weekly basis! We take pride in offering unique cookies, treats and gift items using premium ingredients your horse will flip over. We use San Francisco's own "Giusto's" ground flax, oat flour and barley (human grade) and Organic carrots, sweet potato, and banana. We top each cookie off with a special yummy treat! Member of the Saddlefit4Life global network of equine professionals dedicated to comfort, protection and performance of the horse. Using diagnostics, our saddlefitters will find you the best solutions on-site. Fine custom horse gear in the Californio tradition. Inspired by the classic gear of yesterday, built for the working cowboys of today. 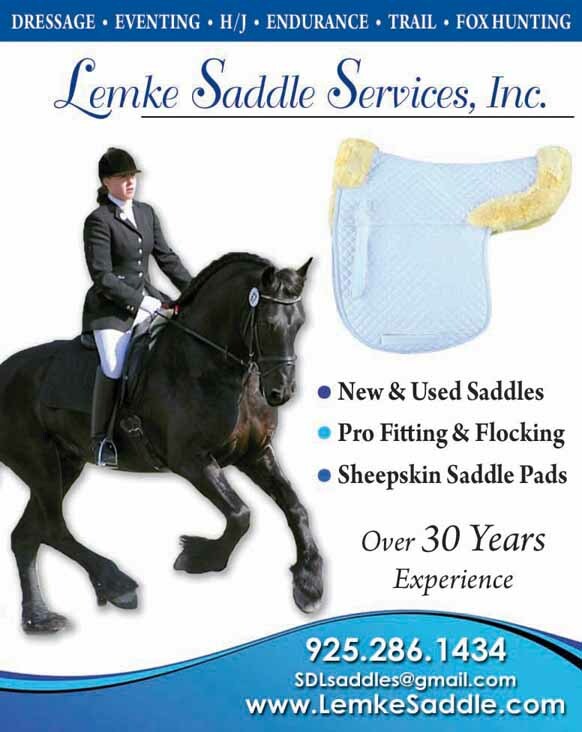 Specializes in English riders, wide selection of breeches, bridles, saddle pads, and other equipment. Equine health care products & gift items. Healthy Horses, Naturally! The Bay Area's online resource for natural care products for horses from supplements and first aid products to premier brushes and hoof boots. Antares Saddle Rep for California!